Clouds are made up of minute water droplets or ice crystals that condense in the atmosphere. The creation of a cloud begins at ground level. As the Sun heats Earth's surface, the warmed ground heats the surrounding air, which then rises. This air contains variable amounts of water vapor that has evaporated from bodies of water and plants on Earth's surface. As the warmed ground-level air rises, it expands, cooling in the process. When the cooled air reaches a certain temperature, called the dew point, the water vapor in the air condenses into tiny microscopic droplets, forming a cloud. If condensation occurs below the freezing point (32°F; 0°C), ice crystals form the cloud. Clouds appear white because sunlight reflects off the water droplets. Thick clouds appear darker at the bottom because sunlight is partially blocked. English scientist Luke Howard (1772–1864) developed a system to classify clouds in 1803. He grouped clouds into three major types: cumulus (piled up heaps and puffs), cirrus (fibrous and curly), and stratus (stretched out and layered). To further describe clouds, he combined these terms and added descriptive prefixes, such as alto (high) and nimbus (rain). The International Cloud Classification presently recognizes ten forms of clouds, which are grouped into four height categories. Low-level clouds range from ground level to 6,500 feet (2,000 meters); mid-level from 6,500 to 20,000 feet (2,000 to 6,100 meters); high-level from 20,000 to 40,000 feet (6,100 to 12,200 meters); and vertical from 1,600 to 20,000 feet (490 to 6,100 meters). Low-level clouds: Stratus, nimbostratus, stratocumulus. There are three forms of low-level clouds. Stratus clouds, the lowest, blanket the sky and usually appear gray. They form when a large moist air mass slowly rises and condenses. Fog is a stratus cloud at ground level. Nimbostratus clouds are thick, darker versions of stratus clouds. They usually produce continuous rain or snow. Stratocumulus clouds are large, grayish masses, spread out in a puffy layer. Sometimes they appear as rolls. If they are thick enough, stratocumulus will produce light precipitation. Middle-level clouds: Altostratus, altocumulus. The two forms of mid-level clouds have the prefix "alto" added to their names. Altostratus clouds appear as a uniform blue or gray sheet covering all or almost all areas of the sky. The Sun or the Moon may be totally covered or shine through very weakly. These clouds are usually layered, with ice crystals at the top, ice and snow in the middle, and water droplets at the bottom. Altostratus clouds yield very light precipitation. Altocumulus are dense, fluffy white or grey balls or masses. When closely bunched together, they appear like fish scales across the sky: this effect is called a mackerel sky. High-level clouds: Cirrus, cirrostratus, cirrocumulus. The three forms of high-level clouds are called cirrus or have the prefix "cirro" added to their names. Cirrus clouds, the highest, are made completely of ice crystals (or needles of ice) because they form where freezing temperatures prevail. Cirrus clouds are often called mares' tails because of their white, feathery or wispy appearance. Cirrostratus clouds are also made completely of ice crystals. They usually cover the sky as a thin veil or sheet of white. These clouds are responsible for the halos that occur around the Sun or the Moon. Cirrocumulus clouds, the least common clouds, are small roundish masses, often having a rippled appearance. These clouds usually cover a large area. They are made of either ice crystals or supercooled water droplets (droplets that stay in liquid form below the freezing point). Vertical clouds: Cumulus, cumulonimbus. Two forms of clouds can extend thousands of feet in height. Flat-based cumulus clouds are vertically thick and appear puffy, like heaps of mashed potatoes or heads of cauliflower. They form when a column of warm air rises, expands, cools, and condenses. Low-level cumulus clouds generally indicate fair weather, but taller cumulus can produce moderate to heavy showers. Cumulonimbus clouds are thunderstorm clouds, rising in the air like a tower or mountain. 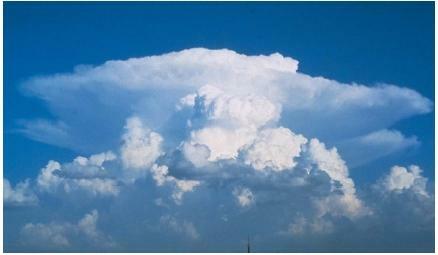 The peak of a mature cumulonimbus resembles the flattened shape of an anvil. Because they often contain powerful updrafts and downdrafts, cumulonimbus can create violent storms of rain, hail, or snow. This is Amazing gives me all the information i need about this..